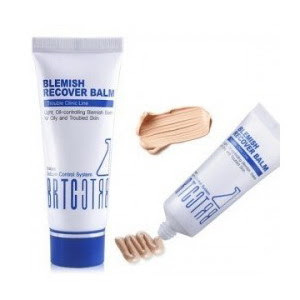 The BRTC Blemish Recover Balm is specially designed for troubled skin, touting such properties as oil control, trouble care, and skin protectant. This BB Cream also has SPF28, is moisturizing and oil free. It's features natural ingredients such as lavendar, chrysanthemum, dandelion root and various flower extracts. The texture is thick and give me a medium-high coverage. Cover blemishes and little pimples well. Feels lightweight on my skin. Oil Control is good (4-5hours). Moisturize my skin well but not makes my face oily. It doesn't cause me a break out or new acnes. Quite pricey for full tube. Hard to get in my country. I don't feel heavy on my face, because I just use a little for my entire face. Usually I use a compact powder for the final layer, but when I used this BB cream I chose to end it by using loose powder. So overall it doesn't makes my face feels heavy. I've totally been wondering about this brand, so thank for the review! i've been really curious about this brand too..
where did u purchased this Sha?? after read your review, I think I will buy this BB cream.. I was curious with this product and have been searching for the ingredients list since there are many raves out there. This is quite pricey anyway. I've always been curious to try BB cream (yes, I'm a beginner >.<) n really want to try one esp this brand since I have acne prone skin.. Now I know where I can buy the samples.. Anyway, so after we put BB cream we can still put powder? If yes, which one is better? Loose or compact? Or is it better use it without powder?? How the way did you usually wear it?? Sorry too much to ask..
To use powder (or not) after BB cream is depends on the people itself. For me, I love to use loose powder after I apply BB cream, because BB cream usually have an oily texture (and I have a super oily skin even when i don't use anything on my face) so to reduce that "oil" on my face, I use the loose powder. For which one is better, compact or loose? It is depends on the BB cream. If the BB cream’s coverage is already heavy, usually I use loose powder as final touch (for example: BRTC). If the BB cream’s coverage is light, usually I use compact powder as final touch.